In 1923 the floods were pretty hard to ignore. On April 28th when it started to rain heavily there were 6 bridges across the St Croix – Baring, Milltown, the old abandoned arch bridge, the railroad trestle, the Union Bridge and Ferry Point. By May 1st only the Ferry Point bridge remained intact. The power station was in ruins as were all the railroad tracks from Milltown to Baring. The water was so deep in some areas it was possible to paddle a canoe over the electric lines on the telephone poles. Both Milltowns were flooded, the street railroad was out of commission because its track were twisted and broken at Milltown and Calais was cut off from the outside world. Jurors who had been summonsed to a term of Superior Court in Calais according to the Advertiser “had to walk, wade and boat, only to find on arrival the term had been adjourned to next week.” Jurors obviously took their duty much more seriously in 1923 than they do today. In the St Croix Valley, 1923 was the year of the great flood. It occurred at the beginning of May. The May 2nd Calais Advertiser reported as follows “The scene on the river in the vicinity of Milltown was one of wild grandeur, one no person ever witnessed on the St Croix before, and it is doubtful if they will ever witness the likes again on these waters. The banks of the river were crowded all day Tuesday with spectators and the interest has not yet subsided.” The New York Times even found the event newsworthy, reporting some Milltown families were forced to the upper floors of their homes by the rising water and for several days could only get around by boat. 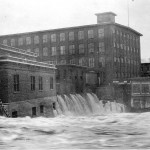 The flood of 1923 resulted in severe economic damage to the St Croix Valley. Of the 5 bridges over the river only one, the Ferry Point Bridge, survived intact. The Baring, Union Street and Arch bridges were washed away, the Milltown Bridge was badly damaged. The most devastating loss was to the Cotton Mill in Milltown NB which in 1923 was the principal employer in both St Stephen and Calais. The ground floor of this enormous mill was completely flooded. It took months to repair the damage to the mill, once the largest in the world and many workers never regained their jobs. 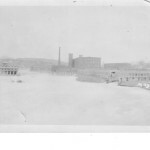 This view of the 1923 flood shows the weave shed on the right and the Salmon Falls railyard. Water streams out of the first floor of the cotton mill in Milltown, N.B. during the flood of 1923. 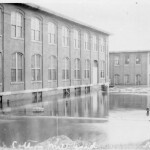 This is a closer view of the exterior of the cotton mill during the 1923 flood. The bottom floor of the mill was entirely flooded. 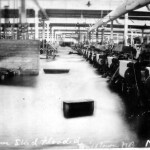 This shot shows the interior of the cotton mill in Milltown, N.B. 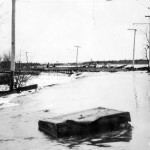 during the 1923 flood. 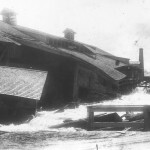 The mill was heavily affected by the flood and it took several years to get it back into full operation. 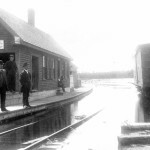 The railroad station in Milltown, Maine (located just across the tracks from the water company that still remains there today) during the flood of 1923. These mills were on the Canadian side. The water company smokestack and buildong across from US Customs are visible to the right. The flood of 1923 took out every bridge (including the Milltown bridge, seen here) except the Ferry Point bridge.